UNITED NATIONS, Aug 17 2016 (IPS) - Judging by the latest polls it now seems more likely that the United States will have a female President in 2016, than the United Nations will have a female Secretary-General. Despite widespread support for the next UN Secretary-General to be a woman, female candidates have not fared as well as men in the first two so-called straw polls of UN Security Council members. However the campaign received a small boost from UN Secretary -General Ban Ki-Moon this week when he told an Associated Press Journalist in California it is “high time” for a woman to hold his job. Unfortunately Ban’s support may come too late for the five female candidates who remain in the race. By custom, the 15 members of the Security Council select their preferred candidate, with the five permanent members China, France, Russia the United Kingdom and the United States yielding the additional power to veto candidates they dislike. The most recent straw poll confirmed that former Prime Minister of Portugal, Antonio Guterres is easily the most popular candidate, with 11 Security Council members encouraging him to continue his campaign. Of the top four candidates, the only woman is Susana Malcorra, the current Foreign Minister of Argentina and former Chef de Cabinet to the Executive Office at the United Nations, with eight encourages and 6 discourages. 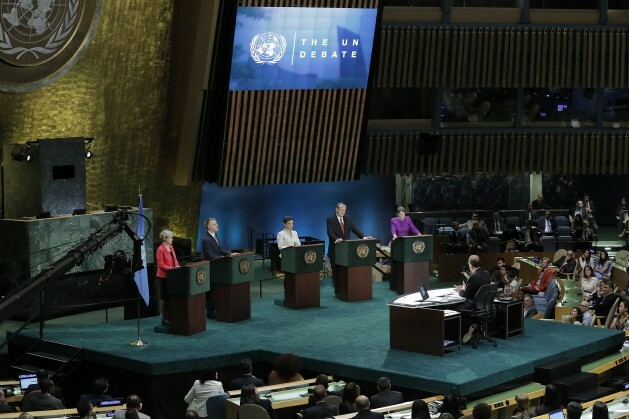 “The straw polls continue to reflect the deep seated male bias embedded in the UN and its member states, in spite of their claims to work for gender equality and women's empowerment." -- Charlotte Bunch. It is difficult to tell exactly which candidate will prevail, since the leaked results of the straw polls do not specify who voted for who. Even Guterres’ seemingly safe position could be undermined if one or both of the two discourages he received were from veto-wielding permanent members. “It has been disappointing that after many countries gave lip service to this idea, the votes have not followed their words,” added Bunch, who is also a core committee member of the Campaign to Elect a Woman UN Secretary-General. Five women, and 11 candidates in total, now remain, after Vesna Pusnic of Croatia withdrew when she placed last in the first straw poll. “Several of these women have served as heads of UN agencies and departments as well as in prominent positions in government, and are clearly as qualified as the men on the list,” said Bunch. They include Irina Bokova, of Bulgaria who is currently Director General of the UN Educational, Scientific and Cultural Organization (UNESCO) and Helen Clark, former Prime Minister of New Zealand and current Administrator of the UN Development Programme alongside Malcorra. Christiana Figueres of Costa Rica, who led the UN Framework Convention on Climate Change to the successful adoption of the Paris Climate Change Agreement in 2015, is also one of the candidates. “The straw polls continue to reflect the deep seated male bias embedded in the UN and its member states, in spite of their claims to work for gender equality and women’s empowerment,” said Bunch. Jessica Neuwirth, Director of Donor Direct Action and founder of Equality Now, which first launched a campaign for election of a woman Secretary-General in 1996 told IPS that she “couldn’t agree more” with Ban’s comments. Men have now led the UN for over 70 years, with women’s leadership only made incremental gains, despite decades of campaigning to increase gender equality at the higher levels. “In Beijing in 1995 at the Fourth World Conference in Women governments undertook to ensure the inclusion of women at the highest levels of decision-making in the UN secretariat,” said Neuwirth. Neuwirth also expressed disappointment that women hadn’t fared better in the straw polls. “As a group they did better in the public debates than they did in the straw polls,” she said.